John Gonzalez and Amy Sherman of MLive and "Behind the Mitten" visit Territorial Brewing Co. in Springfield, Michigan (near Battle Creek). 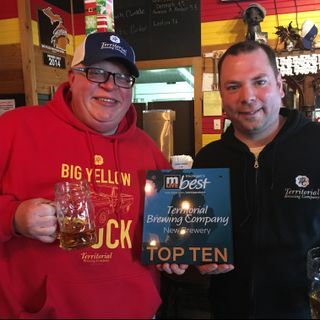 Territorial was one of their picks for Michigan's Best New Brewery. This episode includes interviews with reps from the Air Zoo in Portage, and Binder Park Zoo in Battle Creek. John and Amy have a lot of fun talking to Troy Thrash, President & CEO who oversees all operations of the Air Zoo in Kalamazoo. The Air Zoo will feature a lot of special events for the holidays. Learn more about the Air Zoo at http://www.airzoo.org/. John and Amy talk to Brett Linsley (manager of wildlife and conservation) Amy Riegel (President & CEO) of the Binder Park Zoo in Battle Creek. They have a lot of activities for the holidays, and they're also introducing some new animals. More info at http://www.binderparkzoo.org/. Charles Grantier and Tim Davis of Territorial return to talk more about their brewery, as well as BEER OF THE WEEK. This week it's With Love from Denmark, a beer brewed with a dark roast coffee from Kalamazoo Coffee Company. It's base is a Danish Pilsner, which gives it a light-color. John and Amy also run down some events -- thanks to the Forest Hills Fine Arts Center. More events at http://behindthemitten.com/.